Lyle J. Goldstein, in the National Interest, reports that The Chinese military appears to be making a careful study of the military history of its likely main opponents: the US and Japan. 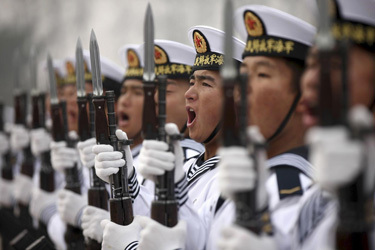 China’s military has not had much combat experience in recent decades, and this is recognized among Chinese military leaders as a potentially serious problem. The reasons for this scarcity of battlefield know—how are obvious and might even be praise-worthy. It has been nearly four decades since Beijing undertook a significant military campaign, so how would its armed forces have attained this knowledge? As I have argued many times before in this forum, nearly four decades without resorting to a major use of force represents very impressive restraint for any great power. “China’s People’s Liberation Army (PLA) has sought to remedy its lack of actual combat experience by the careful study of military history, including the bloody Pacific War as I have noted in other Dragon Eye columns. August is steamy in the South Pacific and so the Guadalcanal campaign that began in August 1942 was hell. It was through that campaign that the fate of the Pacific was decided. While the dazzling miracle of Midway gets infinitely more attention, the grinding attrition battle just a few months later of Guadalcanal, which could be termed the ‘Verdun’ of the Pacific War, ultimately proved to be the turning point. Losing 38 ships and perhaps over 700 aircraft proved devastating for Japan, although these losses were quite similar to those suffered on the American side. The difference, of course, was that America could replace these losses quite easily. “Late last year (Dec 2017), the Chinese Navy’s official magazine Navy Today [当代海军] carried a reasonably detailed analysis of the crucial Guadalcanal campaign. The article concludes that Japan’s ‘command decisions and weapons development errors greatly increased the losses [指挥决策和装备研发上的失误更是大大加速了失败],’ together with fundamental problems in Japan’s strategic culture. The Chinese analysis of Japanese mistakes in the campaign is neatly divided between errors in strategic judgment, operational and tactical errors, as well as mistakes in developing appropriate weaponry. One Feedback on "The Chinese Military is Studying Military History"
In terms of manufacturing capacity, the US today vs China is in the same situation as Japan vs the US was in 1940. On the other hand, the loss rates of personnel and equipment are likely to be so large that manufacturing capacity won’t matter in in US-China war. It will be a war of pure attrition, a come as you are war. We will lose a lot of carriers, but we have a bunch to begin with.